When anything becomes both valuable and collectible, it’s inevitable that sooner or later, someone will attempt to reproduce it in order to profit from presenting and selling the reproduction as if it were the real thing. It happens with money, paintings and stamps, and unfortunately, rare records. While many counterfeit records were easily identified and sold as such when they were new and plentiful, over time, people forget about them or forget how to distinguish them from original pressings. Often, buyers will pay top dollar for records that aren’t authentic. Just as often, the sellers of those records aren’t even aware that the item they’re selling is a counterfeit, rather than an original pressing. Counterfeit records, pirate pressings and bootlegs have been sold to unwitting collectors for decades, though the practice of making counterfeit records seems to have peaked in the late 1970s. In this article, we’ll cover the history of counterfeit records, show a few examples of some frequently seen titles, and offer some general advice as to how to avoid inadvertently paying a lot of money for a record that may be a forgery. Before going into detail about these questionable pressings, it’s important to understand the terminology and the differences between the three kinds of unauthorized records that are usually encountered in the market. Counterfeit records – Counterfeit records are unauthorized releases of any record that are intended to duplicate the original, authorized pressing in order to fool the buyer into thinking that they are buying the genuine item. These records often look quite a lot like original pressings and can easily fool the untrained eye or inexperienced buyers. Most counterfeit records are singles or albums by major artists and are usually reproductions of items that are long out of print or titles which were only issued for promotional or radio station use. Pirate pressings – Pirate records are pressings which contain recorded music which has been previously and legitimately released, but are packaged in such a way as to not fool the buyer into believing they are buying the original item. Pirate pressings may contain the exact same songs as a well-known album, but may have a different cover, a different title, a different label and record company mentioned on the product, and often may feature all of those things. A relative of pirate pressings are so-called “tax scam” labels, which often popped up for short periods of time to release records for the express purpose of losing money. The Tiger Lily label may be the best example of this. Unlike counterfeit records, which are made to fool buyers into paying money for a rare collectible, pirate pressings were often sold at the same price as regular albums, and were simply manufactured to make money from buyers who might otherwise buy the legitimate album. Bootlegs – Bootleg albums are records which contain previously unreleased material, usually by a well-known artist. Bootlegs represent an entirely new product, and are not intended to fool the buyer into believing that they’re buying a legitimate release from a major record company. While there are some exceptions, most bootleg records do not represent legitimate releases and usually contain previously unreleased studio or live recordings. The term “bootleg” is often used interchangeably in casual conversation with “counterfeit”, or “pirate” to refer to any record that was not authorized by a record company and/or recording artist. This usage is incorrect and often confuses collectors and would-be buyers, as bootlegs are distinctly different products from counterfeit records. The three terms, counterfeit records, pirate records and bootleg records refer to three distinctly different products. Despite this, one will often hear even experienced record sellers refer to a counterfeit record as “a boot,” as in, “This record isn’t original; it’s a boot.” One rarely encounters the term “pirate” among collectors, but that may have a lot to do with the fact that pirate pressings, while once quite common in the 8 track tape format, have always been relatively rare in the record market. Counterfeit records have been sold to collectors for decades; the earliest examples likely date to the age when records were still shaped like cylinders. Many rare blues 78 RPM singles have been counterfeited, as well. All five of the Elvis Presley singles issued on the Sun label have been counterfeited in both 45 and 78 RPM formats, as these became collectible rather early in Elvis’ career. As collectors started to seek out records that were no longer available for general sale, unscrupulous individuals decided to fill the need in the marketplace by making reproductions. Early attempts were often of questionable quality, but as technology improved in the graphics industry, so did the quality of the counterfeit records produced by these individuals. While some counterfeit records were produced to be sold to collectors at the market price for the reproduced item, many titles were simply sold in quantity to record wholesalers, often at rock-bottom prices. The album generally regarded as the most-widely counterfeited album ever, Introducing the Beatles, was often found in the 1970s in stores selling them at discounted prices that rarely topped $4. Few buyers likely thought they were buying a rarity at those prices, especially when the discount bins were often full sealed copies at that price. Of course, over the decades, many of these records have changed hands multiple times and their origins have long been forgotten. Today, people find the now-40-year-old-copies of that Beatles album and assume that they must be original because they’re old, or because their parents bought them as children. In fact, they’re just forty year old counterfeit records. While some titles, such as Introducing the Beatles, often appeared in bargain bins, other counterfeit records were made to fool buyers purchasing brand new releases. In the late 1970s, counterfeit copies of new titles by major artists often found their way into the distribution chain. At that time, it was sometimes possible to buy counterfeit pressings of a new album the very week it was released. These were sold by stores that may have had no idea that the records they were selling were fraudulent in origin. Perhaps the most famous example of this was the soundtrack to the film, Sgt. Pepper’s Lonely Hearts Club Band, featuring the Bee Gees. This album was pressed in large quantities in anticipation of it becoming a big seller. Unfortunately, the movie was a flop and the record sold poorly, leading many retailers to return them to distributors. The record company reportedly had more copies of this particular album returned to them from distributors who couldn’t sell them than they had pressed in the first place. Regardless of whether the records being reproduced were older collectibles, rare promotional items, or new releases, the motivation for those who made them was the same – to produce them as cheaply as possible and to sell them at a profit. Most often, counterfeit records are rare titles by major artists, though there are also plenty of examples of relatively obscure titles by artists that are unknown outside the collecting community. The latter is particularly true of albums in the garage rock and psychedelic rock genres. To list all known examples of counterfeit records, even in the rock and roll category, would be a thankless task best suited to encyclopedists. Still, there are a number of well-known examples that most collectors are likely to encounter sooner or later, and that would include, not surprisingly, counterfeit records by the Beatles. Introducing the Beatles – Introducing the Beatles is the granddaddy of all counterfeit albums; no other record has ever come close. It’s quite likely that the counterfeit copies of this album outnumber originals by two or three times, despite the fact that the original album sold quite well. Introducing the Beatles was released on the small Vee Jay label in January, 1964 and due to legal action, was out of print by October of that year. After that, it became a highly sought after collector’s item, and the counterfeiters took over to fill that demand. Early counterfeit issues were clumsily produced, with fuzzy covers and poor color. Later pressings were much more convincing. With original pressings of the album, mono copies outnumber stereo copies by a ratio of roughly 50:1, making stereo copies quite rare. Naturally, about 95% of the counterfeit copies have covers that say that they are stereo. What they don’t have are records that say they are stereo, and every fake copy of this album we’ve ever seen with a stereo cover had a record that played mono and lacked the word “stereo” on the label. Original pressings were made with surprisingly thick vinyl with stamped numbers in the trailoff or “dead wax” area near the label. Most counterfeit copies are pressed with thinner, more flexible vinyl and have handwritten numbers in the dead wax. Counterfeit copies of the album that feature a color band around the label are usually missing the color green in the band. The easiest way to determine whether a copy of Introducing the Beatles is genuine or not is to look at the hole on the label. Do both the title of the album and the name of the group appear above the label? If so, the record is likely genuine. If the name of the album and the name of the group are separated by the play hole, then the record is a counterfeit. Any copy with a brown border around the front cover is a fake. Many original pressings of Introducing the Beatles included a custom Vee Jay paper inner sleeve. These are missing on all counterfeit copies. Counterfeit copies of Songs Pictures and Stories of the Beatles leave out the word “Stories” from the title. Songs, Pictures and Stories of the Fabulous Beatles – The counterfeits of this album omit the word “stories” from the title and lack the original album’s gatefold cover. The Beatles and Frank Ifield on Stage – Originals have the title of the album written on the spine of the cover; counterfeit copies do not. Yesterday and Today – Many of the counterfeit copies of the Beatles famous “Butcher Cover” have front covers that feel slick to the touch, while originals had a rough feel to them. Many of the fakes have colored vinyl records; the originals were all black. The colored vinyl pressings are technically pirate issues. Let It Be – Believe it or not, this album was out of print for several years in the late 1970s, so some wily individuals made copies of it. Originals have a red label with sharp printing; the fakes that we’ve seen have pinkish labels with somewhat blurry printing. The Savage Young Beatles – (see image above) Original pressings feature the catalog number on the front cover printed in black; the counterfeit copies show the number in red. The Beatles Christmas Album – This one can be tricky, as many counterfeit copies of this record are quite convincing. The original album had a cardboard cover with a paper slick glued on; most of the fakes have the cover art printed directly on posterboard. On original pressings, look at the second photo on the lower left of the front cover. The words “theater royal” are legible on original pressings. Note: the presence of the stamped words “Bell Sound” in the vinyl are not necessarily an indication of an original pressing, as many of the fakes have this. John Lennon/Yoko Ono – Two Virgins – Original U.S. pressings included a brown paper outer cover that was sealed with a round white sticker on the right side. Copies with brown covers that open on other sides, which lack the sticker, or copies where the brown wrapper is not large enough to cover the entire album cover are likely fakes. Roots: John Lennon Sings the Great Rock & Roll Hits – Counterfeit copies of this 1975 mail order album are quite convincing, especially since the original pressings were so poorly made.Original pressings included a custom inner sleeve advertising other albums on the label, and had the title of the album printed on the spine.On original covers, the text on the other albums shown on the back cover is legible, and on original discs, the catalog number is faintly etched on the label itself. Ed Rudy – American Tour With Ed Rudy #2 – an album of Beatles interviews. 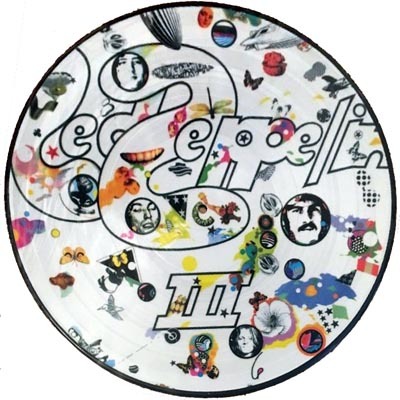 Original pressings had thick, ultra-heavy vinyl; the counterfeit pressings used thin, flexible vinyl. David Bowie – The Man Who Sold the World – Original U.S. pressings of this 1970 album featured a cartoon cover, but were quickly deleted due to poor sales. Counterfeit pressings have handwritten matrix numbers in the dead wax; originals have stamped numbers. The labels on original pressings are smooth in texture, while the fakes tend to be pitted. Johnny Burnette and the Rock and Roll Trio – Originals of this album sell for thousands, and were pressed on thick, brittle vinyl and had the title of the album printed on the spine. Fakes have thin, flexible vinyl and no spine printing. 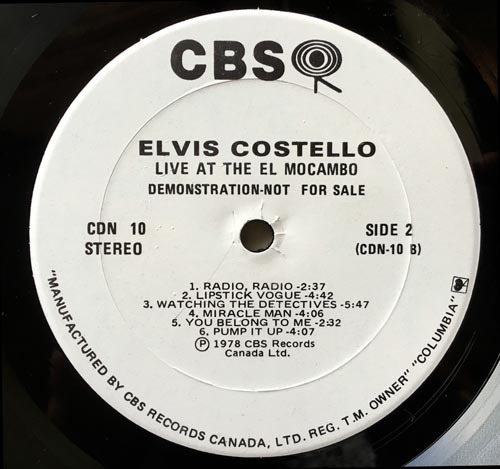 Elvis Costello – Live at the El Mocambo – This late 1970s LP was originally issued only to radio stations in Canada. Most counterfeit copies have flimsy posterboard covers and labels with tears around the spindle hole. Many fakes of this album have completely different labels altogether. Emmylou Harris – Gliding Bird – This was Emmylou Harris’ first album originally had a color cover and label. Copies that have black and white printing are fakes. Buddy Holly – That’ll Be the Day – Like the album above, originals of this album sell for thousands, and were pressed on thick, brittle vinyl and had the title of the album printed on the spine. Fakes have thin, flexible vinyl and no spine printing. Phil Lesh/Ned Lagin – Seastones – Fake copies of this odd electronic album have posterboard covers; the originals used paper slicks glued to a cardboard cover. Madonna – Erotica – This 12” single picture disc is one of the few picture discs to have been counterfeited. Originally pressed as a legitimate release but withdrawn before being distributed, the original pressings are quite rare and sell for thousands of dollars. Genuine copies have stamped matrix numbers; counterfeit copies do not. Todd Rundgren – Runt – Todd Rundgren’s 1970 solo album was counterfeited several times in the late 1970s and include versions on both the Ampex and Bearsville labels. On all copies, the words “Queens Litho in U.S.A.” are clearly legible on original covers but not on the fakes.The fake Ampex copies usually have a red printed box on the cover that mentions “We Gotta Get You a Woman.” Originals do not have this, as the “box” was actually a sticker that was attached to the copy used to make the counterfeit pressings. Oddly enough, the rare variation of Runt that includes alternate takes and mixes has not been counterfeited. The City – Now That Everything’s Been Said – This 1968 LP featuring Carole King originally had a color cover and label; the fakes have black and white covers. The Yardbirds – Live Yardbirds Featuring Jimmy Page – This album by the Yardbirds was released by the band’s former label to take advantage of the success of Jimmy Page’s new band, Led Zeppelin. Page sued and the album was withdrawn from sale but was quickly counterfeited to meet collector demand.Counterfeit copies of this album exist on both the Epic and Columbia Special Products labels. Look for pitted labels and tears around the spindle hole on the fake copies, which may have stamped matrix numbers in the dead wax just like the originals.The most common counterfeit pressing of this album features a black and white cover and a black and white label. You would think that this would immediately suggest to anyone that this album is a counterfeit, as all original pressings had color covers and yellow labels, but we’ve seen a lot of people over the years selling these as “white label promo” copies.There are no legitimate white label promotional copies of this album; even the copies sent to radio stations had yellow labels. Not that it matters, since the white labels on the counterfeit copies do not indicate that they are promotional pressings. All copies of this album that have either black and white covers or white labels are counterfeits. The Banana Splits – The Banana Splits – The soundtrack to this 1970s children’s show was once quite collectible, counterfeit copies of a white label promo copy exist. David Bowie – An Evening With David Bowie – promotional interview album; the counterfeit copies are quite convincing. Chocolate Watch Band – The Inner Mystique – Counterfeit copies of this album have white labels; the originals were brown. Gandalf – Gandalf 1969 psych LP on Capitol. David Gilmour – David Gilmour (1978) – We once inadvertently bought a counterfeit pressing of this album brand new from a major record store chain within a month of the album’s initial release. Mad River – both Capitol albums by this late 1960s band have been counterfeited. Leslie West – Mountain – Fake copies of the debut LP by Leslie West have poorly printed covers and labels. The Yardbirds – For Your Love – The counterfeit pressings of this LP are quite good, though the quality of the photos on the front cover is not as good as the original pressings. This list is far from complete; there are hundreds of examples of counterfeit albums. Pirate pressings are records containing material that is legitimately available elsewhere, but is packaged differently. The purpose of these pressings, unlike counterfeits, is not to fool the buyer into thinking that they’re buying something rare and valuable, but to simply get the buyer to pay for it. In the 1970s, pirate 8 track tapes were quite common and were often sold at truck stops and convenience stores. Titles would be identical to those sold in record stores but the labels usually lacked artwork and the names of the companies producing the products were different from legitimate issues. Pirate records, by comparison, are less common. A company called Melody Recordings issued a number of titles in the early 1970s, all of which had the same cover, depicting two crowns and two scepters. There were other labels that released such albums in the early 1970s, but they were largely out of business by 1975, due to increased enforcement of U.S. copyright laws. In the mid-1980s, a label called Koala popped up that issued a number of albums by well-known artists, all without liner notes or photos of the artists themselves. Little is known about this label, which the covers claimed was based in Hendersonville, Tennessee. …along with dozens of others. Most contemporary pirate pressings fall into a gray area that resides somewhere between pirate pressings and counterfeit records. The most common examples would be records which appear, at first glance, to be official record company issues, but which are pressed as either colored vinyl records or picture discs, even though no official release of those album exists in those formats. All five Elvis Presley 78 RPM discs on the Sun label have been pressed on colored vinyl, for example. The pressings are thin, flexible vinyl, when the originals were made from rigid shellac, and were, of course, all black. On the colored vinyl issues, the covers usually look identical to the original issues. The labels may or may not look the same, and are often older label designs that mimic the designs used on the original issues of the albums, rather than the labels currently in use. This Dylan album has three stickers, and they’re likely all fakes. Click image for larger version. While counterfeit records remain a problem and will likely continue to be one for as long as records are sold, a relatively new problem has popped up in recent years, largely involving records sold on eBay by a relatively small number of sellers. That problem involves counterfeit stickers and records that have been resealed in shrink wrap in order to fool buyers into believing that used records are new ones. These records are sealed examples of albums that are rarely found in sealed condition, and these sealed examples usually have rare and/or previously unseen stickers attached to the shrink wrap. To be clear, there’s nothing unusual about finding still sealed examples of older or rare records. We have plenty of sealed records for sale in our store. Nor is there anything particularly unusual about finding sealed records for sale that have stickers on the wrap. Older sealed records are often found with price stickers still attached, and some older albums had “hype” stickers attached that were intended to make potential buyers aware that the album contained a particular song, or that it contained a poster, for example. The problem is that it appears that there are a few sellers on eBay and elsewhere who are finding nice used examples of rare records, re-sealing them in shrink wrap, and then attaching newly-printed stickers to the wrap. In some cases, the stickers are common ones that were often seen on those titles when they were new. In other cases, the stickers are unusual to the extent that people who have been selling rare records for 30-40 years do not recall ever having seen them before. Not surprisingly, these records, which are almost always titles by collectible artists, such as the Beach Boys, the Beatles, Bob Dylan, Led Zeppelin or the Velvet Underground, end up selling for large, and sometimes, record-breaking, prices. The previously-unknown “promo” sticker. Click image for larger version. With modern graphics programs like Photoshop and affordable laser and inkjet printers, it’s quite easy to scan and print convincing replicas of stickers, especially since many of them consisted only of white text on black paper or black text on white paper. The problem is that the stickers are fake, the shrink wrap is fake, the “new” record is almost certainly a used one, and most importantly, the seller makes no effort to make any of those things known to potential buyers. The records are presented as rare, sealed examples of original pressings with rare, previously-unknown stickers. Obviously, it’s difficult, if not impossible, to determine if a sticker or shrink wrap is original or not via photographs online. On the other hand, there are a few things that potential buyers should consider when examining such items. They only have records by top-tier artists for sale and they’re all valuable items. It’s all Beatles, Rolling Stones, Led Zeppelin, Velvet Underground, etc. Every album has one or more stickers on the shrink wrap. Every album (or nearly all) are still sealed, or are opened copies that still have shrink wrap on the cover. Look for common stickers. We’ve noticed that a lot of these records tend to have price stickers from either Sears or Kmart. While both stores sold records in the 1960s and 1970s, it’s unusual to see a seller offering 20 records for sale from a broad period of time that all have Sears or Kmart stickers on them.If you see that ten of the albums for sale also have the same price sticker on them, that’s likely a giveaway that something isn’t what it seems to be. The Capitol Records “archive” sticker found on a Beatles Butcher Cover. This Beach Boys album had both stereo and Duophonic banners as well as a never-before-seen Duophonic sticker at the bottom. Click on image for larger version. Look for rare or unusual stickers. Stickers with song titles are common. Check other auction listings to see if other sellers also have albums with similar stickers. Check completed auction listings on eBay and at popsike.com to look for other examples of such stickers to see how common or rare they might be.It would be quite unusual for someone to find a sticker on a cover of an album that is 50 years old that no one has ever seen before. Yet one of these eBay sellers recently had a copy of the Beatles Yesterday and Today album for sale with a sticker that suggested that the album was part of Capitol Records’ archive. The sticker had a typed date and noted that the record was a “second state” Butcher cover. And yes, the cover was still in the shrink wrap. Another oddity from the same seller was a sealed copy of Pet Sounds by the Beach Boys, complete with a never-before-seen sticker that indicated that the album was a promotional copy. The sticker looked very professional, and the album sold for thousands of dollars. Unfortunately, the sticker (and probably the shrink wrap) was a fake, as Capitol designated promotional copies at that time by punching the word “free” or “promo” in the cover, rather than using stickers. Another Beach Boys oddity turned up not long ago. Their first album, Surfin’ Safari, was originally issued with a cover that indicated that the album was stereo. This was an error; the album was not true stereo. Later pressings corrected this by changing the banner to read “Duophonic”, which was Capitols name for their rechanneled stereo process. This particular copy of Surfin’ Safari featured both a stereo and a Duophonic banner, as well as a never-before-seen sticker touting the alleged “benefits” of Duophonic. That album sold for a lot of money, but the entire thing was almost certainly fabricated by an unscrupulous seller. Look for stickers that don’t seem quite right. 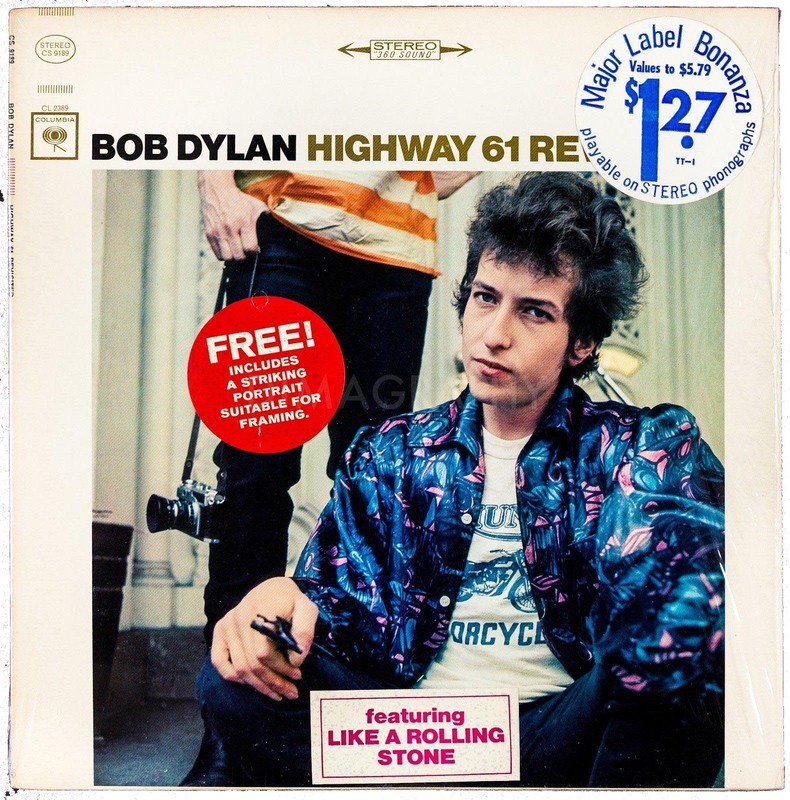 We recently saw a first pressing stereo copy of Bob Dylan’s Highway 61 Revisited (see image above or click here) that had a hype sticker for the song “Like a Rolling Stone”, a hype sticker for the (very rare) photo that came enclosed in the first few copies pressed and a discount sticker indicating that the record had been reduced in price to only $1.27.That’s a first pressing of what was, in 1965, a brand-new record. While all three stickers may be reproductions, the $1.27 sticker is the one that stands out for being wrong, as that album, especially in stereo, would never have been discounted to such a price when new. We’ve also seen stereo copies of Sgt. Pepper’s Lonely Hearts Club Band by the Beatles with similar stickers. While mono copies might have been found in discount bins when Capitol stopped pressing mono records, there would have been no reason to discount the stereo version, which remained in print for decades and which remained a big seller for the entire time it was in print. Be suspicious of stickers that are nicer than they should be. Most genuine stickers are wrinkled, or may have wear or fading, especially after 30-50 years. Newly-printed stickers, of course, will always appear perfect. As an example, consider the first album by the Velvet Underground & Nico, which came with a sticker on the cover that looked like a banana. The cover had a tease printed on it – “Peel slowly and see.” Pretty much everyone who bought that album did try to peel it. Unfortunately, the stickers usually became torn during attempts to peel it, and many people gave up. Most copies seen for sale have a banana that has been completely peeled, one that has been partially peeled, or one where someone tried to peel it, gave up, and then put the now-torn sticker back in place. …and a seemingly perfect unpeeled one, complete with another sticker that no one has ever seen before. Look for listings that have only sealed records or listings where nearly all of the records are either sealed or are still in the shrink wrap. Shrink wrap machines are fairly inexpensive, but finding perfect copies of 50 year old records to reseal is hard. Close examination to check for wear under the shrink wrap may be difficult to do online, but we’ve seen records from some of these sellers where the wear on the cover under the shrink wrap was noticeable even in the photos they used in their auction listing. Ring wear on the cover or wear near the mouth of the cover are often giveaways. Look out for any of the unusual or suspicious things listed above. If everything is rare, perfect, sealed, and has stickers, you’re likely looking at a bunch of fraudulent listings. Don’t do business with sellers that do not offer refunds if you aren’t satisfied. Do your research. At the end of the day, it’s up to you to know what you’re buying. David Bowie – The Man Who Sold the World. Original labels are flat; fakes are shiny and pitted. It can be difficult to identify any particular record as a counterfeit, especially if you do not have a known original pressing at hand with which to make a comparison, or if you have never seen an original pressing before. Labels that are pitted, off-center, or have tears near the spindle hole. Vinyl that has streaks, bumps or other marks that may suggest that it’s of poor quality. Thin vinyl – Records from the 1950s and early 1960s were usually pressed from heavy, relatively rigid vinyl. Counterfeit pressings of those titles are usually pressed on lightweight, flexible vinyl. Incorrect cover construction – Older album covers were usually printed on paper slicks that were then glued to gray or brown cardboard. Many counterfeit records have covers that are printed directly on white posterboard, making the covers thinner and lighter. Poor cover detail – Printing and detail on both the album cover and the label may be of poor quality or be somewhat blurry. Make sure that the smallest text on the cover is completely legible. Incorrectly formatted matrix numbers – Many original pressings from major labels have machine stamped numbers in the dead wax area. Most, but not all, counterfeit records have hand etched numbers. There are exceptions to this, however, and some fakes do have stamped numbers. Buyers should always be suspicious of any unusually rare record offered for sale in exceptional condition at a price that seems too good to be true. One thing that almost all counterfeit records have in common is that they’re always in mint condition. Why wouldn’t they be? They’re likely new. Original copies of albums that are 30-50 years old, on the other hand, rarely turn up in new, unplayed condition, so buyers should take that into consideration if you’re unsure. It’s unfortunate that people want to take advantage of record collectors, but if there’s a record that people want to buy and it’s rare, chances are good that someone has reproduced it for profit. Your best advice when considering a purchase is to buy from reputable dealers, or find someone who may be familiar with an original pressing and get their opinion before buying. While most counterfeit records can be spotted by an experienced eye, a few are exceptionally good copies. Be careful when buying, especially if the condition and the price seem too good to be true.